Machine guns are gone over in detail, as they should be. Their development changed warfare tremendously. The book goes into the various countries' early machine guns, and how their armies attempted to come up with tactical plans for their usage. The pictures in the book are incredible. They not only show a large amount of obscure armaments, but also allow us to glimpse the life of a soldier from a hundred years ago. The illustrations of bunkers, guns, and ammo teaches you how the war's nuts and bolts really worked. The section on trenches describe not only the trenches themselves, but all of the defensive measures taken. On page fifty-nine is something I had never read about before. It shows a British Mark IV tank overturned in what can only be described as a 'Tiger trap' built for tanks. Simple yes, but incredibly effective. The section on artillery shows many different guns from all of the combatants, many that I had never seen a picture of. The pictures of gas mortar batteries are especially sinister looking. The chapter on mortars alone is worth the price of the book. Many books on World War I artillery pay scant or no attention to this weapon. On page 148 there is a drawing of a makeshift German 24kg 'mortar' in the loosest use of the word. It is really an iron pot with two attached rails to it. Just looking at it makes me feel for the extremely gallant or foolhardy soldiers who had to use them. There is even an illustration of a German spring catapult to toss grenades or gas bombs. This chapter is especially full of one of a kind photos and illustrations. 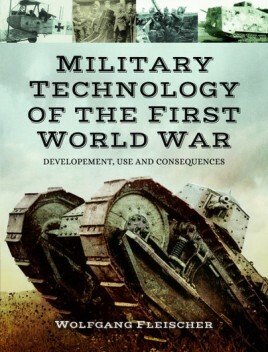 For those interested in the military technology of the First World War, this book is an instant buy. For those of us who are interested in obscure and sometimes one of a kind weapons this should also be on your shelf.